As you may know, this month is even more jam-packed with Daredevil action than last month. Wednesday of this week saw the release of Daredevil: Dark Nights #2 (reviewed below), and on Wednesday we have both Daredevil #28 and Indestructible Hulk #10 to look forward to. I never got around to reviewing Indestructible Hulk #9, as I had intended, so I will review the two-parter Blind Rage in one post some time next week, after we have the full story. Anyway, the main series of Daredevil will double-ship in July, which means that we’ll get Daredevil #29 just three short weeks after #28 comes out. Everyone up to speed? Good! After getting the story elements set up last month, Lee Weeks leads us through the middle chapter of his story Angels Unaware with this second issue of Daredevil: Dark Nights. It is an issue that is just as gorgeous as the first one, but even more jam-packed with drama, and I feel that this is an all-around much stronger issue. I know that quite a few of us where confused with the extent and duration of Matt Murdock’s amnesia in the first part of this story. When we meet him again, in this issue, that particular part of the plot has been (mostly) put to rest. 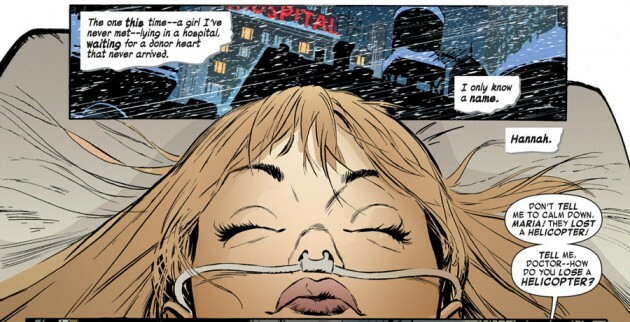 While the ambiguity surrounding when exactly Matt got his memory back points to a slight weakness in the first issue, the second benefits from having Daredevil’s mission seem a bit clearer to reader and hero alike. Having said that, we still see him trying to make sense of his newly returned memories and put them to use for him in his current search for the crashed helicopter. The scene in which Daredevil finds the site of the crash and tries to retrieve its crew and most precious cargo, is really well written and makes very good use of Daredevil’s ability to hear heartbeats. I won’t say more than that, in case you haven’t read it, but there is a twist involving some medically advanced technology that feels quite poetic. At the same time, this issue suffers from some of the problems I had with the first one, namely that Daredevil comes across, to me, as the least interesting character in the book. Where I find the doctors at the hospital, the helicopter crew and the suffering family (now saddled with a major ethic dilemma) to be multi-faceted and instantly relatable, Matt seems distant to me. I think the reason I feel this way, is the same one I stated last time (though in other words): There is something too perfect about him, too angelic, too “superhero.” I don’t really feel his distress, even when he is ever so visibly overcome by the elements. While there are far fewer religious overtones in this issue, compared to the previous one, I can’t help myself from getting Christ-like vibes from Daredevil in this story, and for me, at least, that gets in the way. I am convinced that this resonates with many readers, but I’ve made no secret of my preference for a more morally ambiguous, low-powered and “down to Earth” take on the character. Speaking of “low-powered,” I also feel like I have to mention the opening scene of this issue. Just like the scene I moaned and groaned about in my review of Dark Nights #1, Daredevil’s powers here (specifically, his sense of hearing) is so off the scale that it almost took me out of the book. While I’m sure I tend to be much more picky about things like this than the average Daredevil fan, the scene in which it is suggested that Daredevil can hear multiple conversations in exact detail over (presumably) great distances in the middle of a snow storm is a very good example of crossing the line from superhearing to ESP. If this were Superman, it wouldn’t bother me, because he already defies the laws of physics in so many other ways, but with Daredevil, I always prefer that writers err on the side of modesty. These quibbles aside, the story as a whole is compelling and interesting. Even when I find myself more invested in little Hannah and the people around her, than I do in the main character. And, as mentioned before, the artwork is fantastic. Lee Weeks is even better than I remember from his earlier Daredevil work and the colors by Lee Loughridge fit the line art perfectly and contributes greatly to contrasting the warm indoors with the harsh cold of the elements. Considering the added strengths of this issue compared to the first one, I have high expectations for a satisfying ending to this story. Wonderful story so far. Lee Weeks art is just amazing.His style and layouts have always complimented Daredevil well. I almost enjoyed this issue more than the regular series this week. This first two issues have been great. Week’s art and eye for detail is inspired, as is his panel layouts. I can see your points about his hearing bordering on ESP. 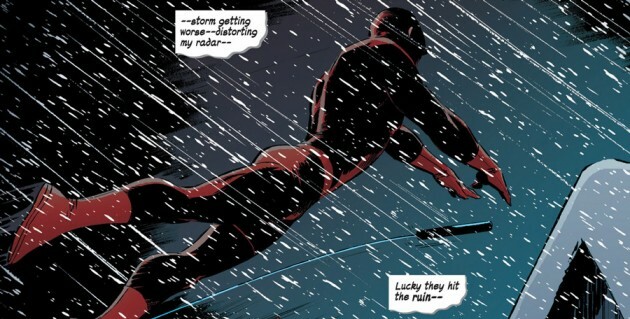 In the first issue, the snow was enough to ‘fog’ his radar, allowing for a third mugger to attack him from behind. Yet here, the snow has no apparent effect on his ability to hear conversations from blocks away. But I think, in this case, the story dictates the strength of the ability. Weeks wanted to point out, that in a crisis situation like this, some miscreants will take advantage of it and even though DD might be aware of it, he can’t be everywhere at once. So some people will get hurt and damage will be done and he bears the weight of knowing about it, but unable to do anything about it. My only nitpick is Ben Urich. That’s him obviously at the Daily Bugle offices, which we’ve seen in both issues yet he’s never named. If a new reader picked this up, he or she would have little clue as to who this person is nor of his long connection with DD. Otherwise, strong dramatic issues and I’m looking forward to the conclusion as well as the other upcoming issues.